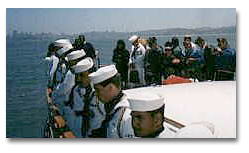 A memorial service at sea is an increasingly accepted and preferred method of interment. Many spouses are now considering scattering at sea as an affordable, thoughtful, reasonable and timely alternative to funeral services on land. The National Cemetery Administration cannot provide burial at sea. Atlantis Memorials has been conducting ash dispersals at sea for families for the past 12 years off the coast of Northern California, the San Francisco Bay, and the Golden Gate Bridge. Each service is handled individually, with respect and reverence. The exact Global Position System (GPS) location coordinates are recorded and provided to the family on the Certificate of Disposition. This enables family or friends to "re-visit" the exact site where original disposition took place. The boat trip is exclusively for your family . . . only one family goes at a time. Our luxury yachts, the MV Empress and the MV Avalon, are US Coast Guard inspected and certificated vessels. Captain Gerry Robertson and crew oversee all dispositions to insure any special family wishes are accommodated, where possible.